The green jacket layering is fantastic, the black piece over the backpack straps is a nice touch. What´s the designer of the slip ons in the first pics?????? Celine ? But for Men? That´s style! Those coats are AMAZING! I agree. I love the total look of the man with the long lovely hair. The way he is holding that cigarette is a bit rough trade. LOL! Wow that first and the last coat are amazing, love the fact that the coat had two colors, it’s realy nice and they just match it so well! Except for #3, it looks like men wearing womens’ fashions at womens’ fashion week. To be honest, I am less interested in what they’re wearing to how flipping gorgeous each of them are. 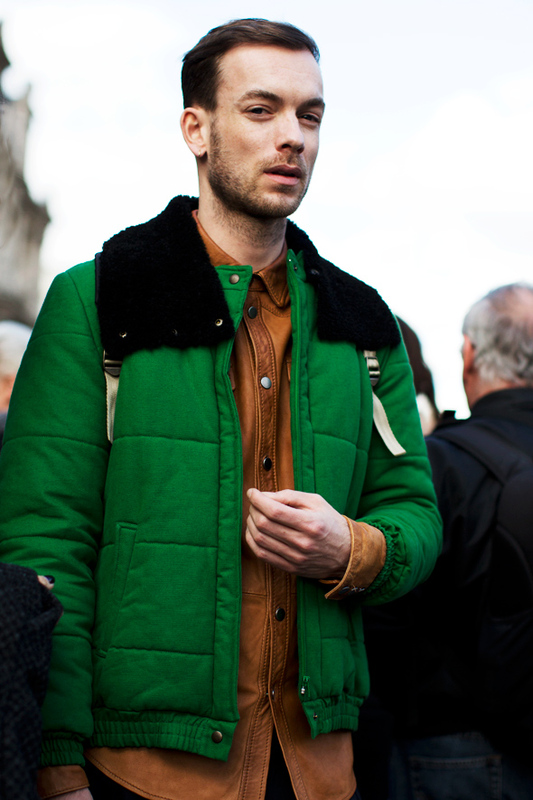 That being said, I enjoy the striking contrast of the green jacket over the camel shirt. HAHA! Exactly what I was thinking, especially about the blond viking guy in pic two. I may not know men’s fashion; but I know what I like! Thats a great looking mature man. The first coat gives the impression that its owner is wearing a black top, white belt, and red skirt (at least until I scroll and see pants where bare legs or stockings are expected). Pretty cool trick; pretty cool coat! Omg. Love the colours in the first photo. 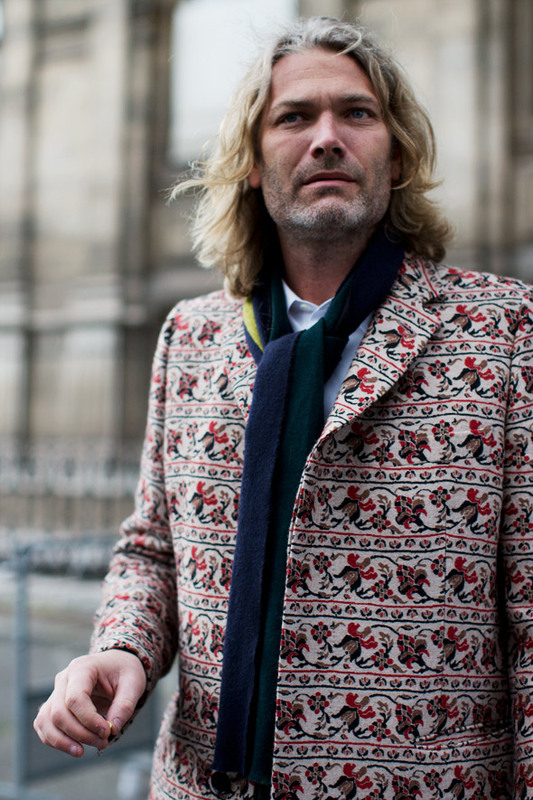 Any ideas who makes this fab coat? Holy cow! A dicky…and worn quite nicely. You think that a man should have long nails? They look attractive to me. I admire the imagination behind those outfits. And I am actually a little jealous :-) . I also love the hair of the gentleman at the first pic, but what there is not to love? Interesting combinations. Two have jackets with two different colours not sure about that look. All the looks are great, and I could easyly imagine myself wearing the same outfits! and where is my photo?? The color blocking in the last coat is enhanced by the wearer’s haircut. I feel like the first coat is set off by the styling of the hair. Definitely making a similar neck piece because it’s been so cold here in NYC! 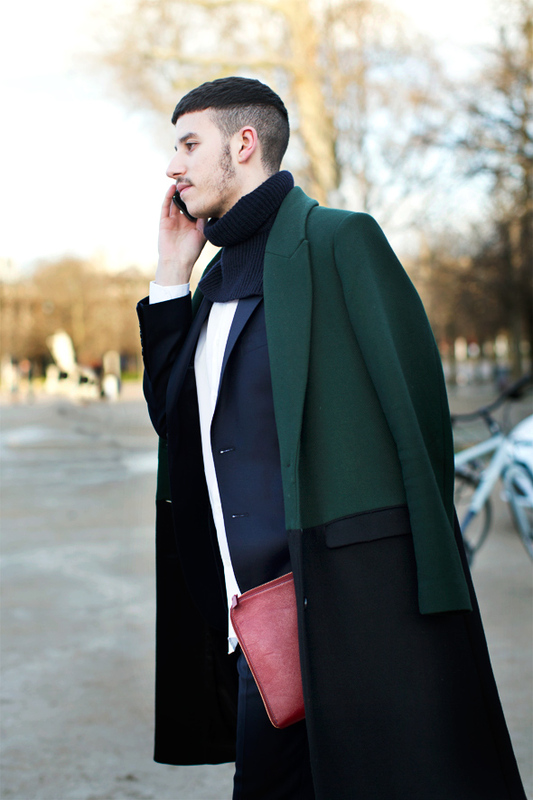 Love all of these coats, especially the color-blocked ones. Where to find them in the U.S. where stores seem to be avoiding the color-block bandwagon?! Anybody have an ID of the leather shirt in photo3 ? These men know how to dress appropriate! Nice outfits, a lot of people can learn something from them. I especially like the last outfit. That coat is outstanding! Made by a genius. 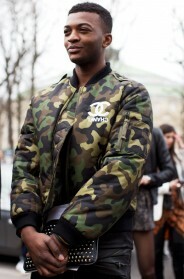 what brand is the green coat and black picture 4? 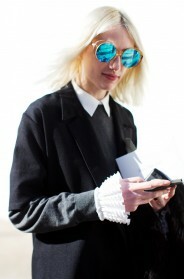 i like this street fashion week.